Stock status is current as of 4/23/2019 12:10 PMET. 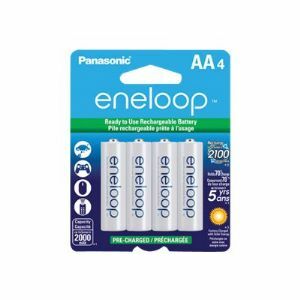 Eneloop Ni-MH "Low Self Discharge" batteries utilize Panasonic's advanced rechargeable battery technology allowing them to be recharged up to 2100 times. Eneloop battery cells deliver consistent power performance, maintain 70 % of their charge for several years, come pre-charged by solar power (at the factory) and are ready to use out of the package. These Eneloop cells also have increased storage life and extreme temperature performance down to -4� Fahrenheit.